Absolute World Towers was completed in December 2012. A view of the Absolute Towers development at night in Mississauga, Canada. How the Absolute Towers residential complex looks from the air. Construction of the fourth and fifth towers, Absolute World 1 and 2, began in 2007. 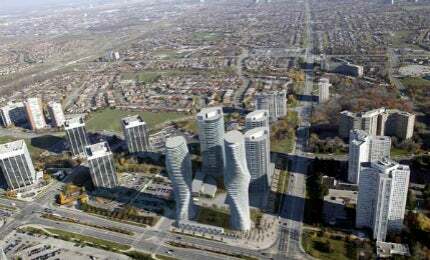 Absolute Towers is a set of five residential towers in the city of Mississauga, Ontario, Canada. Construction of three of the towers was completed in 2008. The last two blocks, Absolute Word 1 and Absolute World 2, were completed in December 2012. The two towers are also known as the ‘Condo Couple’. Imposing, statuesque and endowed with an undulating sequence of curves, it’s no surprise that MAD Architects’ mesmerising Absolute World 1 was nicknamed ‘Marilyn Monroe’ for its curvy, hourglass figure by smitten locals. In Mississauga, Canada’s sixth largest city, Beijing-based MAD saw fit to embrace not only a global trend for curvaceous skyscrapers, but also for satellite developments to express the town’s individuality. The Council on Tall Buildings and Urban Habitat (CTBUH) named the Absolute Towers the Best Tall Building in the Americas for 2012. "Absolute Condos is a five-tower glass, concrete and steel luxury condo complex." Built by Ontario builders Fernbrook Homes in collaboration with Toronto developer Cityzen Development Group, Absolute Condos is a five-tower glass, concrete and steel luxury condominium complex in Mississauga, opposite the Square One shopping mall. The residential towers fan out from a 30,000ft private recreation centre. The tower turns 180 from the base to the top. The Absolute Condos is located on the north-east corner of the crossroads of Hurontario Street and Burnhamthope Road, a gateway to the Mississauga town centre. This location enabled MAD Architects’ design for the final two towers to directly address visitors and others travelling into the city. Principals of MAD Ma Yansong, Yosuke Hayano and Dang Qun said that Mississauga, a fast-developing suburb in orbit around Canada’s largest city Toronto, sought a new and unique identity. The Condo Couple has a continuous balcony around the entire skyscraper in place of the commonly used vertical barriers. The building makes a different angle at different levels to provide a 360 view to each unit. Just two years after being founded, MAD Architects won first prize in an international competition in 2006 to design phase IV of the sculpture-like construction. Phase IV is 56 storeys (170m) high making for a total 45,000m of floor space, dubbed Absolute World 1. The design was so admired that the studio was commissioned to design a sister building, Absolute World 2, next door. Absolute World 2 or phase 5, the fifth tower of the project, incorporates 50 storeys and is 150m high, boasting a total floor space of 40,000m. However, unlike Absolute World 1, the second, more northern tower is wider in the ‘waist’. MAD said part of the idea was to evoke the city dwellers’ desire for nature, exposing them to the sensuality of sunlight and wind. The curvy, wraparound balconies, accessible from all principal rooms, offer maximum light. The aerodynamic balconies have a solar passive design, which provides shade in summer and sunlight in winter. This design makes the tower energy efficient by reducing the energy load. Each tower is crowned with a residents-only terrace and lounge. The Vancouver House is expected to be the most striking feature of the new waterfront Beach District neighbourhood, upon completion in 2018. The three older towers are complementary, but less curvaceous. The first Absolute apartment block features 850ft two-bedroom apartments while the second, A, has 850ft to 1,260ft two-bedroom apartments, mostly with balconies. Building three, the Club Tower, ranges from 765ft two-bedroom apartments with an additional 60ft balcony to 1,250ft three-bedroom-plus-den penthouses with an additional 92ft of balcony. Absolute World 1 offers five different floor plans for two-bedroom apartments – 755ft to 1,030ft in size, all with large 155ft to 280ft balconies. There are six levels of underground parking. The floors of the Absolute Towers are oval-shaped. Each floor is increasingly oval, which maintains the curves and twisted outline. The towers are supported by a grid of concrete load-bearing walls, which manage the load fluctuation created by the oval-shaped floors. The balconies are covered by cantilevered concrete slabs to provide thin edge profiles. Construction of the last two towers started in 2007 when Burka Varacalli Architects was hired by MAD as a local partner. The construction was planned to be completed in 2010. By January 2010 22 storeys of the first tower were completed. Construction of the second tower began in early 2010. The two towers, budgeted at a total $1.3bn, aimed to manifest potential power while making a statement to the surrounding area and social context, according to MAD. Sigmund Soudack & Associates was the structural engineer for the project. ECE Group was the mechanical / electrical work contractor, while NAK Design Group was the landscape architect. Burka was the associate architect for the project. The subcontractors involved in the construction were Costa Earthmoving for excavation, Faga Group for under-slab drainage, Deep Foundations Contractors for shoring and Premform group for formwork. The interior design was provided by esQape design. Gilbert Steel was contracted for rebar and Innocon for concrete supply. Other contractors included Mayfair Electric and ThyssenKrupp Elevator.